Have you ever wondered what to do with those unwanted, out-of-date or leftover household chemicals found in your kitchen, bathroom, laundry, garage or garden shed? The correct way to dispose of potentially hazardous chemicals is through the CleanOut program. 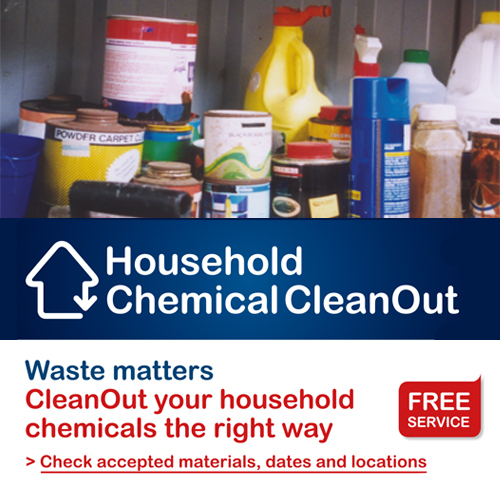 CleanOut is a FREE service for the safe disposal of a range of common household chemicals which could cause harm to human health and the environment if not disposed correctly. CleanOut events are held at various locations throughout NSW at specified dates throughout the year. See the locations and dates below or contact your local council for more information. Locations and dates are subject to change, so please check the schedule prior to attending your next event. Inquiries: info@environment.nsw.gov.au or phone the Environment Line 131 555. Locations and dates are subject to change, so please check prior to drop-off. Materials are not accepted outside advertised times and patrons are advised against illegal dumping. Opening times are 8 am - 2:30 pm (unless otherwise stated). At CleanOut events household quantities, up to a maximum 20 litres or 20 kilograms of a singular item, will be accepted. Business-related and commercial quantities are not accepted at CleanOut events. Telephone the Environment Line on 131 555 to find out the correct disposal methods for businesses.